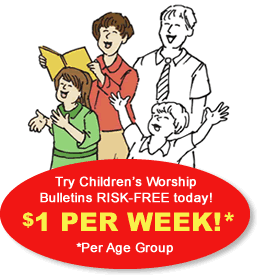 It's easy to teach children about Scripture with Children's Worship Bulletins. Each bulletin has been professionally-designed, vetted by pastors from nearly all Christian denominations and tested by kids. The games, puzzles, word searches, dot-to-dots, codes and mazes are fun, but more importantly, they help children learn important biblical concepts. The library of Children's Worship Bulletins is extensive, covering every major church holiday, important biblical topics and hundreds of specific Scripture passages. But don't worry! It's easy to find exactly what you need. You can search for children's church bulletins about Easter, for example, by using our topic search. Searching for bulletins about specific verses in the Gospel of Luke or from this week's Lectionary is just as easy. It's easy to expand one of the games or puzzles from Children's Worship Bulletins to create a hands-on activity that children will love. In this article, we'll show you how to use ingredients from your kitchen pantry to reinforce lessons from our children's church bulletins about Easter for ages 3-12. Explain the activity, "Today, we're going to hear about Easter morning. While I read our Bible story, solve and color your puzzle 'Easter Morning.'" Read aloud Mark 16:1-8 while the children work on their puzzles. Continue, "What does our lesson say that the women brought with them to Jesus' tomb?" (Answer: They brought spices to anoint Jesus' body.) "To help us remember that Jesus rose from the dead on Easter morning, we're going to use some herbs and spices that the women might have taken with them that morning to decorate our Easter sunshines. You'll be able to wear your Easter sunshine necklace home. Every time you wear your necklace or smell one of the spices that we've used, you'll remember that Jesus rose from the dead for us on Easter." Show the children how to put a little glue onto the back of each Easter sunshine shape and sprinkle glitter and one ground spice onto each. Have the children cut out each decorated sunshine. Help the children tape each of their Easter sunshines onto a length of string. Tie the string ends together with a knot so that the children can wear their finished craft home as a necklace. Explain the activity, "Today, we're going to hear about Easter morning. While I read our Bible story, solve and color your puzzle 'The Resurrection.'" Engage the children in a conversation about first-century Jewish burial rites. Help them understand why aromatic herbs and spices were used on the body of the deceased. Continue, "To help us remember that Jesus rose from the dead for us on Easter, we're going to see if we can identify some of the aromatic herbs, spices and/or essential oils that Mary, Mary and Salome would have taken with them to Jesus' tomb." Give the children the containers you've prepared. Have each child smell the contents. If possible, allow each child to rub a small pinch of each herb or spice between his or her fingers to smell. One by one, point to the names of the herb, spice or oil that you've written on the board, and ask the children to identify each container. Allow them to correctly identify each container by the process of elimination, if necessary. Conclude, "The sense of smell is very powerful. When you smell these herbs, spices or oils again, remember our lesson today. Allow your memory of the smell of each of these aromatics to remind you that Jesus rose from the dead for us."